Make Your Own KIND Bars... The Easy Way! I can NOT stop eating these! You know those super yummy and healthy-ish granola and nut bars that go for $1.50 to $2.00 per bar? Well after all the experimenting in trying to find the best protein and snack bars I decided to see if I could make the perfect bar on my own. I saw a few recipes for KIND bars on Pinterest, but they all looked way too involved and used double boilers and candy thermometers and things I just don’t want to deal with when I’m trying to make it easier on myself, not harder. So I made these suckers with 12 ingredients and about 20 minutes. Honestly I just grabbed everything I already had in my pantry that I thought would make a good bar and put it together, so this recipe can definitely be tweaked later to make different combos and flavors. The initial investment in the ingredients may cost more than buying the bars themselves at first if you don’t have a lot of nuts and seeds in the pantry, but when you figure the cost per bar after making them, its only a couple dimes. You’ll save a ton of $$ in the long run! 1. Line the bottom of a 9X5 baking pan with parchment paper. Combine all dry ingredients (1st group) in a large bowl: seeds and nuts, flaxseed meal, oats, cranberries and chocolate chips. In a small pan over low heat combine the wet ingredients (2nd group) and salt. Continue to stir for a few minutes until mixed well. 2. Pour wet mixture over dry mixture and stir quickly. Pour into the pan and press down firmly with the bottom of a glass sprayed with nonstick cooking spray. Freeze for 10-20 minutes, then remove from pan and cut into bars. 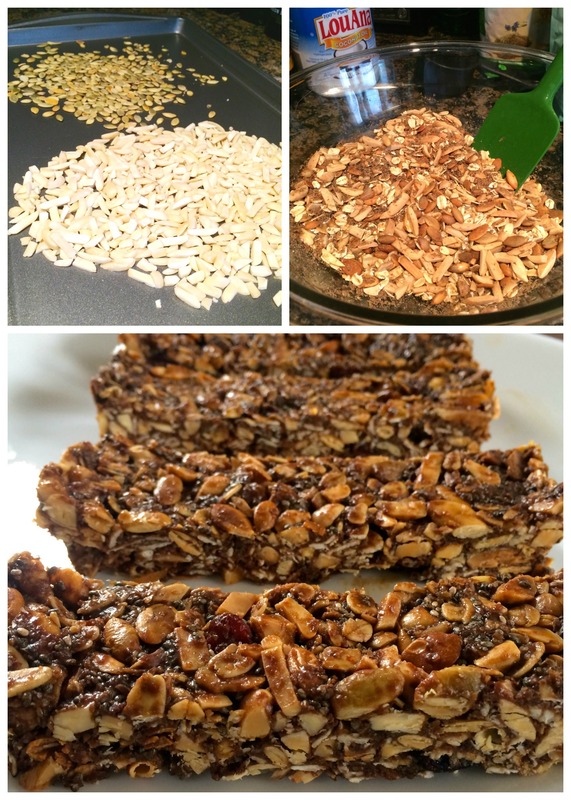 Have you tried any healthy DIY bars at home? I’ve made a few protein bars but I haven’t perfected them yet. I want to see your recipes! If you need help losing weight, improving your performance or increasing your energy, contact me at megan@orlandodietitian.tin or schedule your appointment here. Not in Orlando but still need some nutrition tips? We also do online or over the phone consultations.